The picture of Aaliyah with her fan taken when she first arrived at the Bahamas. 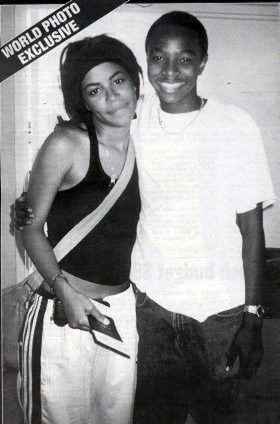 This Bahamian fan skipped his classes to meet his idol Aaliyah <3. Wallpaper and background images in the Aaliyah club tagged: aaliyah babygirl. This Aaliyah photo might contain sign, poster, text, and chalkboard. This picture was actually taken when Aaliyah first arrived at the Bahamas. The New York Post twisted the story/truth which is why some people think that this photo was from the day that she passed. This photo was on the front of their ‘newspaper’ on August 28th, 2001. They claimed they had the exclusive last photo of Aaliyah. That this was taken minutes before she got on the plane. That is not the case. The young Bahamian boy in this photo even came out after the ‘story’ was published saying that the journalist had twisted his words around to suit their publication. Kevin. E. Taylor (who filmed Access Granted) also spoke of a young Bahamian boy who skipped school just to see Aaliyah at the airport when she first arrived. She happily posed for the picture and afterwards she made him call his mother just so she could speak to her & verify that he indeed skipped school to meet her. The last known photo that we have seen of Aaliyah is when she is on the boat with all those who perished alongside her and she’s holding up the Peace sign & smiling brightly.